Dish-owned Sling TV revealed on Thursday that it has added a new premium network option to its lineup for cord-cutters and cord-nevers. For an additional $10 per month, Sling TV subscribers can now add Cinemax to their programming lineup. The addition is noteworthy as it's the first time ever that viewers have access to the HBO-owned network outside of a traditional cable or satellite subscription. The network has offered a mobile app called MAX GO for some time now but again, access was limited to those with a traditional pay TV subscription. 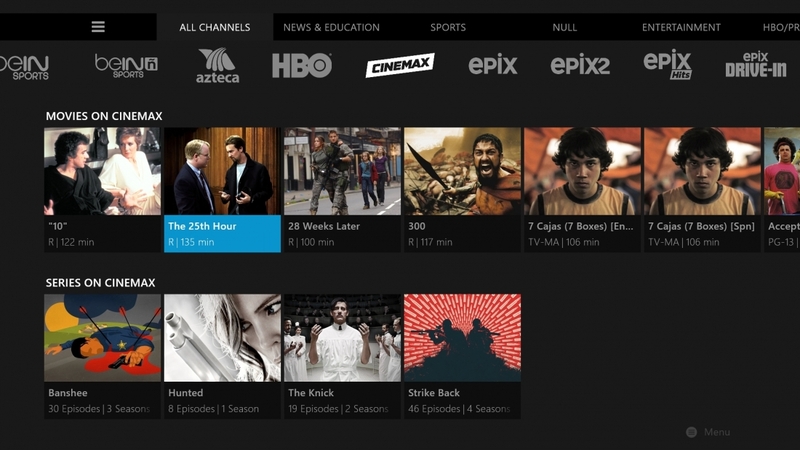 The Cinemax add-on includes access to a live, linear channel that's added to the regular programming guide in addition to the network's collection of more than 500 on-demand movies and TV shows – the same ones you'd find on the MAX GO app. Also included are Cinemax original series including Banshee, The Knick, Strike Back and Hunted as well as the upcoming new series Outcast and Quarry. As with the HBO add-on, those interested in Cinemax must already be a subscriber to Sling TV's $20 core television package. The "Best of Live TV" features more than 20 top channels including ESPN, ESPN2, AMC, TNT, TBS, Adult Swim, Cartoon Network, CNN and History, just to name a few. Sling added access to HBO last year as an add-on priced at $15 per month, joining several other niche-specific channel bundles including Sports Extra, Kids Extra, Hollywood Extra and Lifestyle Extra, most of which are priced at $5 extra each month.